The Good Doctor’s two-hundredth book! The amazing Isaac Asimov has once moer taken pen in hand to tackle his most fascinating subject to date—himself. In this first volume of his autobiography he recounts in his candid and inimitable manner his life’s work in science, science fiction, and practically everything else. Beginning at the beginning, Asimov tells of his family’s emigration from Russia when he was only three. We see the young Isaac, barely more than a toddler, determiend to decipher Brooklynese. Intrigued by signs in the “new” language, he taught himself to read, and whizzed through school as a child prodigy, without modesty, getting A’s in everything except deportment. In his early years at school he befriended a talkative little boy who held Isaac spellbound with his stories. This was Isaac’s first introduction to fiction, and soon afterward he began to borrow science fiction magazines from the rack in his father’s candy store, reading them in secret, and returning them, still looking new. Entering college at the age of fifteen, he emerged from Columbia University. Then there were his stings during World War II and in the Army (for once the military couldn’t fail to recognize a genius! ), his first marriage, and his years teaching biochemistry—to standing ovations from his classes—at Boston University Medical School. All this time he rising to eminence as a storyteller, author of The Foundation Trilogy and “Nightfall,” and laying the groundwork for his future as our most outstanding diverse science writer. In short, this is a book where the man hwo has been called a “national resource and a natural wonder” tells how he got to be that way. A treasure-trove for Asimov fans of all ages, all walks of life. This is the first half of Asimov’s formal autobiography (In Joy Still Felt is the other half). Asimov published numerous books with heavy autobiographical content before this, such as The Early Asimov, Before the Golden Age, Opus 100 and Opus 200, and he would write I. Asimov: A Memoir two years before dying as a third formal “autobiography.” And, of course, he talked about himself an awful lot in his other writings. None of these, however, can compare with the massive two-volume effort. Now, speaking as among Asimov’s most devoted fans, I must confess to being a little overwhelmed by a 700-page book that only covers 1920 through 1954. Asimov is a pretty fascinating guy, y’know, but, gosh, isn’t that a bit—excessive? Asimov was often accused of being stuck on himself, and the truth is he wasn’t. His own phrase—cheerful self-appreciation—comes the closest to the mark as to how he viewed himself. He knew himself well. He knew what he could do and that he was darn good at it. He also knew what he couldn’t do, and was open about that. He was simply fortunate enough to be able to focus his life on what he did well, and the result is that the focus gives the impression that he was a monster of arrogance and conceit. 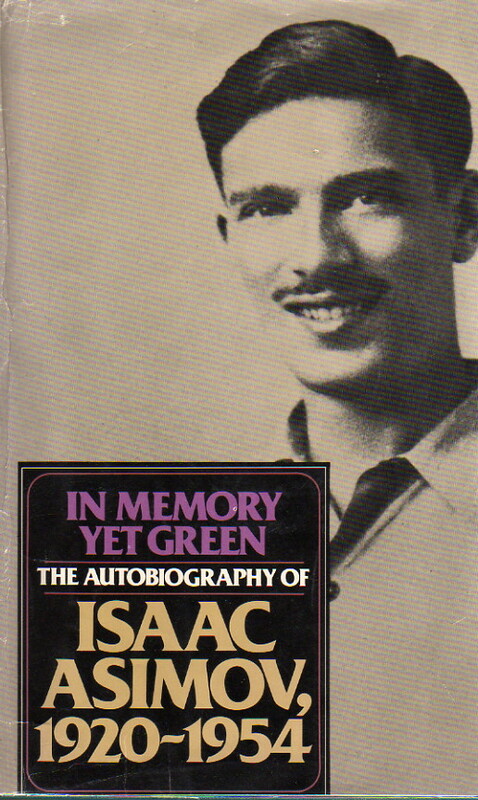 Anyway, In Memory Yet Green starts from before Isaac was born to the life of his parents and works its way through everything in minute detail. In addition to giving us then an interesting look at Asimov himself, we get to see a lot about the world he grew up in, letting those of us who aren’t brilliant Jewish science fiction fans with no religious leanings growing up during the Depression in a candy store run by immigrant parents from Russia—well, the rest of us get a better sense of every aspect of that experience. This volume takes us through his school years, his early career, his triumphs with the original Foundation stories, and his first few books. It closes with the beginnings of the fight over his position at Boston University. It’s a fascinating look at Asimov and his world, and an absolute must-read.